Albion® is a registered trademark of Albion Industries. Top Plate - 1/4" AISI 1045 steel one-piece forging precision machined and through-hardened for long life. Yoke Base - AISI 1023 hardened to 50 Rockwell C. Swivel Section - 3/8" industrial ball bearings mounted in a precision machined raceway. Axle - 1/2" diameter hollow axle with zerk fitting and lock nut on roller and tapered roller bearing models - solid axle on Delrin, Precision ball, and Oilex models. 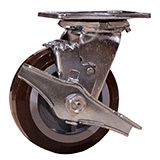 Top Plate Yoke Base - 3/8" AISI 1045 steel one-piece forging precision machined and through-hardened for long life. Swivel Section - 1/2" industrial ball bearings mounted in a 3" precision machined raceway. Legs - 3/8" steel welded to yoke base using 100,000 psi weld filler, welded inside and out. Axle - 3/4" diameter.